Tip: Add a blank page for Page one for the document associated if not needing an image printed on the stub. If your Bill.com Network Profile is set to Public, an invitation to get paid via ePayment will be printed on the check stub for all checks sent from Bill.com. This message will include your unique profile URL, so vendors can easily connect and get paid electronically. When paying more than one bill with the same Process Date to the same vendor, choose to combine the bill payments onto one check or to keep them as separate checks. A single combined check is usually more convenient. But sometimes it might necessary to send separate checks, such as for a tax payment, or for the simplicity of reconciling specific bills with specific checks. The vendor receives one check. The check stub lists the individual bill payments (see below - up to 35 allowed). The vendor receives one email confirmation. There is a fee for one check. If multiple vendor credits are applied, up to three will be listed on the check stub. If more than three vendor credits are applied there will be a note that additional credits are applied after listing three. The vendor receives separate checks. Each check stub shows the first page of the related bill (see above). 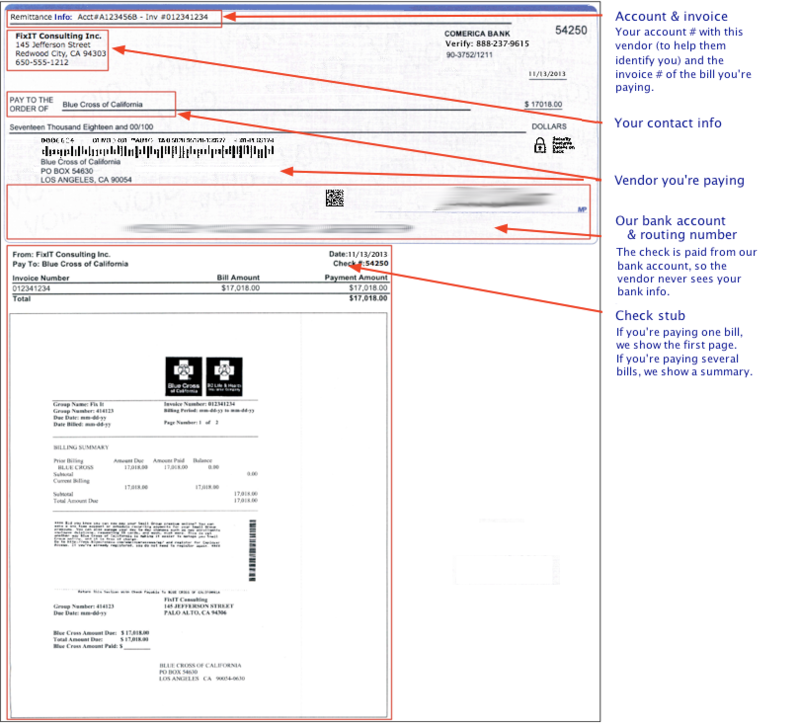 The vendor receives one email confirmation for each bill payment. There is a separate fee for each check. Choose the preference to combine or separate checks for all vendors (Payables Preferences), an individual vendor (vendor page), or an individual payment (when you pay bills). Checks issued by Bill.com can be deposited at your bank, like any other check. You can also use your bank's mobile deposit feature for a hassle-free deposit! Checks issued by Bill.com cannot be deposited using Electronic Check Conversion services. Transactions initiated by Check Conversion services will be rejected by our bank. However, in this case, the check will still be valid, and can still be deposited normally. All checks issued after May 16, 2014 will be printed with the words “Void after 90 days”. On the 91st day after the date of issue, the check will expire. Checks issued before May 16, 2014 will not expire, and will still be honored at any time.